Both James and I will be presenting papers at this year’s Spalding Symposium on Indian Religions, which will be held in Manchester 25th-27th April 2014. [More details here] Our papers will reflect areas of our current research for the Story of Story project. Titles and abstracts below. Hindu, Buddhist and Jain narrative texts exhibit parallel concerns with the tensions between genealogy, teaching lineage and karmic inheritance. While it is fair to say that the anti-Vedic traditions tended to reject ideas of genealogically-inherited religious authority, it is also true to say that they found ways to karmically differentiate between individuals more or less capable of ‘salvific’ insight. There is, indeed, a certain embarrassment of riches in terms of the explanatory resources of early South Asian religious traditions. All three religious traditions were also in the business of addressing their teachings to the realia of early South Asian social life. This meant dealing with temporal authorities, many of whom placed a good deal of emphasis on issues of bloodline and dynastic ‘manifest destiny’. Discussions of karma, genealogy and teaching lineage spoke, then, not just to issues surrounding the explanatory power and perceived effectiveness of a given religious tradition, but also to its institutional framework, ethics and its compatibility with different forms of political authority (amongst other things). In this paper, I will take up narratives drawn from Hindus, Buddhists and Jain traditions ( to c. the C6th CE) in order to explore the similarities and differences in their literary approach to genealogy, teaching lineage and karma. I will cross-reference these materials both with epigraphy and with some of the monastic and socially didactic literature of the three traditions; in the latter, the delineation of forms of preferred social organisation (from the monastic community to the family and the ruling elite) had to be more pragmatic, which makes them an excellent foil for more high-flown literary imaginings (though their ‘pragmatism’ is, on occasion, questionable). The triangulation of literary, ‘legal’ and epigraphic sources also helps to delineate the audience of early South Asian religious narrative. In this way, the paper will develop a comparative approach to the tensions between genealogy, teaching lineage and karma within and between the three great ‘isms’ of early South Asian religious history. “Though Mithilā may be on fire, nothing of mine is burning!” So speaks a renouncing king of Videha, called Janaka in the Buddhist Janaka-jātaka and the Mahābhārata, and Nami in the Jain Uttarādhyayana. The latter name resonates with two other jātaka stories, which tell of king Nimi/Nemi, another king of Videha famous for renunciation. That these characters are part of the same lineage is clear not only from their shared homeland, but also from genealogies such as that recounted by King Janaka in the Rāmāyaṇa, in which he refers to previous King Janakas as well as a King Nimi. Not all the kings of Videha are famous for renouncing, but those that are share certain motifs across all three traditions of early south Asia. In this paper I will explore the interconnected narratives of the renouncing kings of Videha in an effort to understand how each of the three traditions – Hindu, Jain and Buddhist – used this motif and lineage to serve their own agenda. In so doing I will shed light on the connections between these traditions and the value of studying their narratives as part of a broader South Asian heritage. This entry was posted in Uncategorized on February 24, 2014 by naomiappleton. 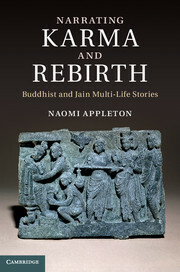 I am pleased to announce the publication of my latest monograph, Narrating Karma and Rebirth: Buddhist and Jain Multi-life Stories, available from Cambridge University Press. More details can be found on the publisher’s webpage. The book is the main output from my British Academy Postdoctoral Fellowship (2009-12, Cardiff University) and was one of the inspirations for the current Story of Story project. I found that looking at Buddhist and Jain narratives of karma and rebirth side by side shed a lot of light on each tradition’s priorities and preconceptions. As in the current project, the many shared narrative elements illuminated the key differences between the traditions, as well as their shared heritage and intellectual context. This entry was posted in Uncategorized on February 13, 2014 by naomiappleton.